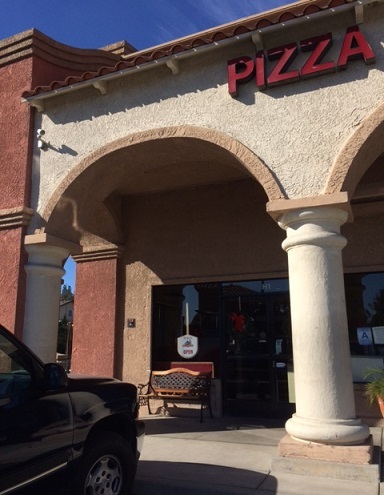 I was meeting a friend for lunch at the Vons center a few weeks ago, with a Mexican restaurant our destination. But then it turned out to be closed that day. 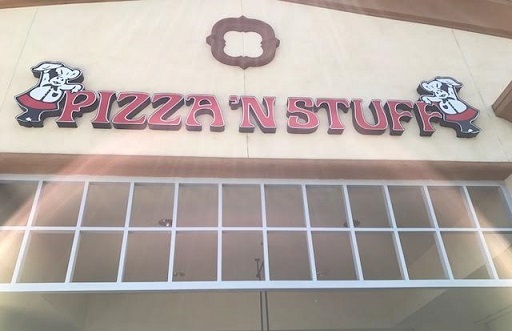 So we went next door to Pizza ‘N Stuff instead. I’d been there a couple of times, but it had been a few years, and might even have been before this blog started. 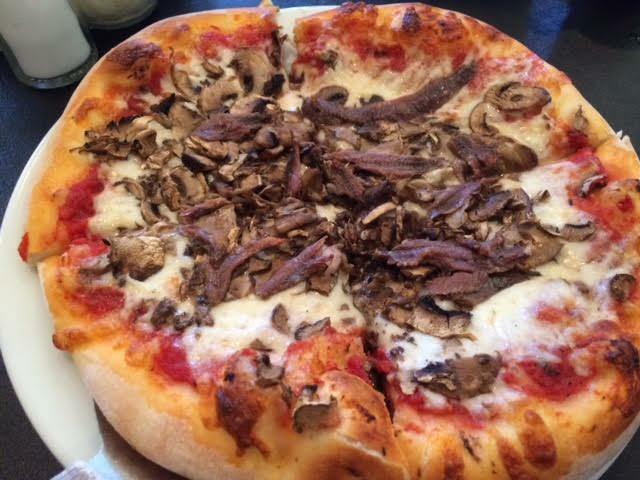 In other words, having a chance to write about Pizza ‘N Stuff was a good fallback. 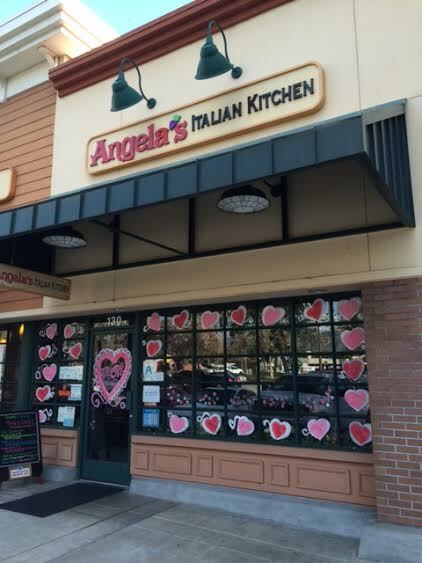 It’s been in business since 1977 — 40 years! — and under the same owners since 1982 — 35 years! Congratulations to them. 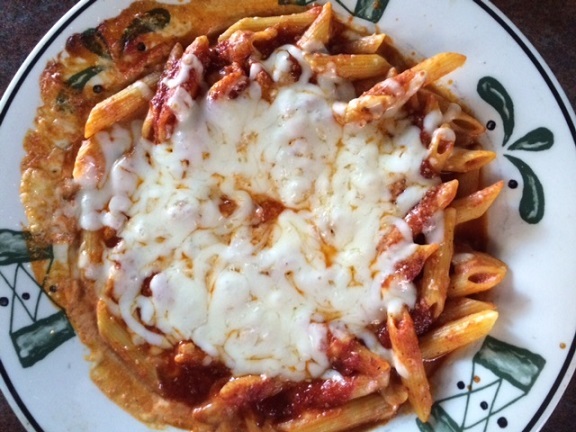 Their menu has pizza, hot and cold sandwiches, salads and an array of pasta dishes. 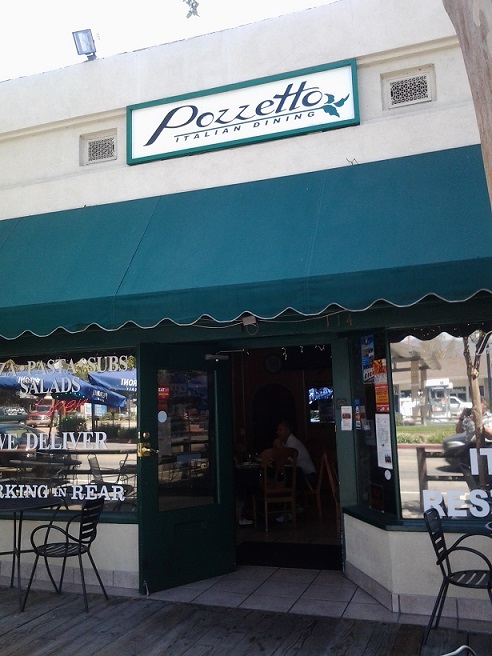 Don’t confuse them with Claremont’s similarly named Pizza n’ Such, although it’s easy to do. 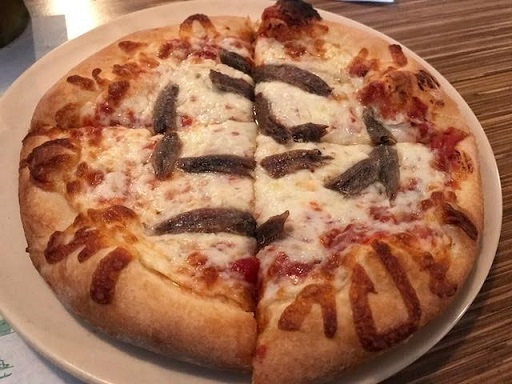 That lunch, I got a mini pizza with one topping (anchovies) and salad ($8.35). 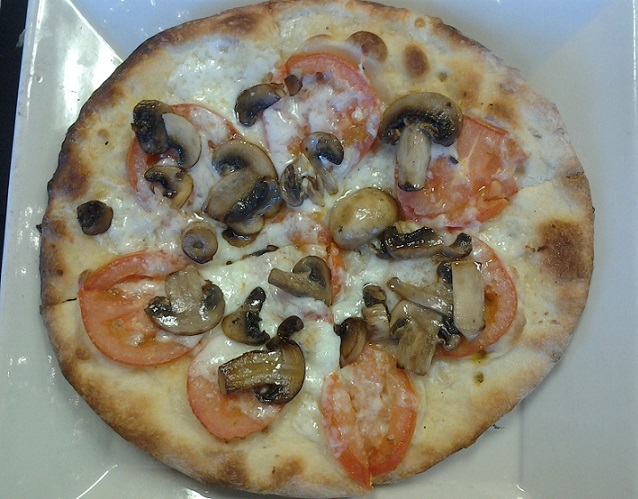 The pizza was cheesy, not bad, but not distinctive. 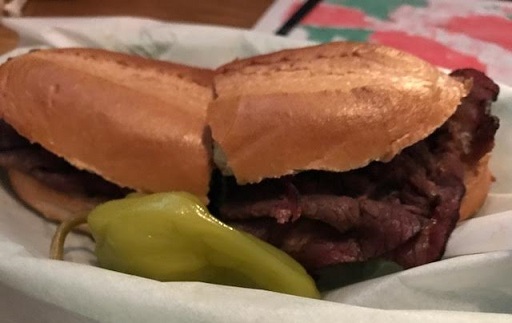 My friend had an Italian beef sandwich ($6.35) plus a side salad ($4). 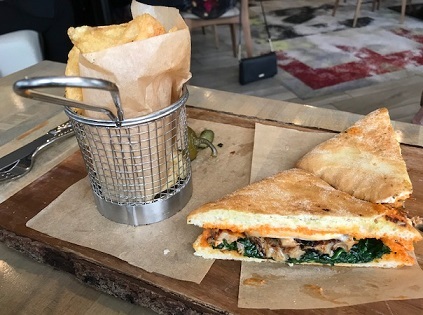 He said the salad was “overdressed and overcheesed,” but he did like the sandwich, even if he’s had better. 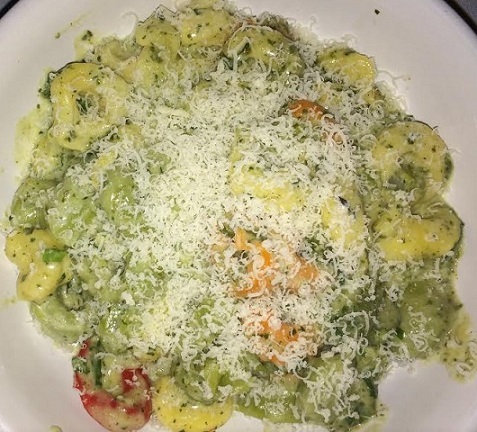 I felt like going back to try the pasta and made a point of going in for dinner one evening. 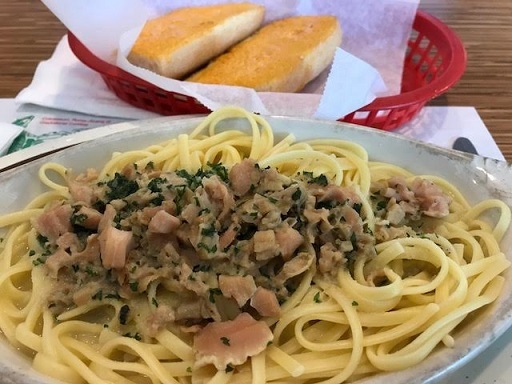 I got the linguini with white clam sauce, a la carte with garlic bread ($12.75); as a dinner ($14.65) you would get soup or salad plus a dish of ice cream, but that was more than I wanted. 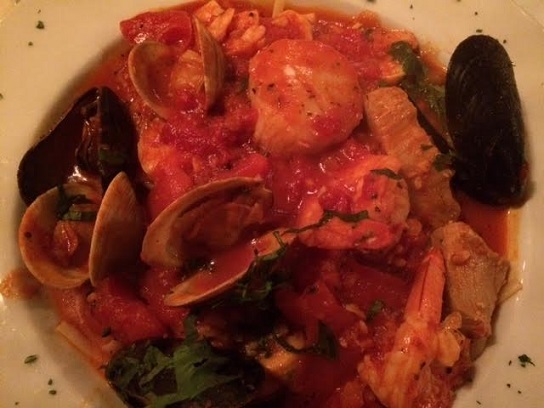 The dish was generous with the clams and tasty. The seating is interesting. 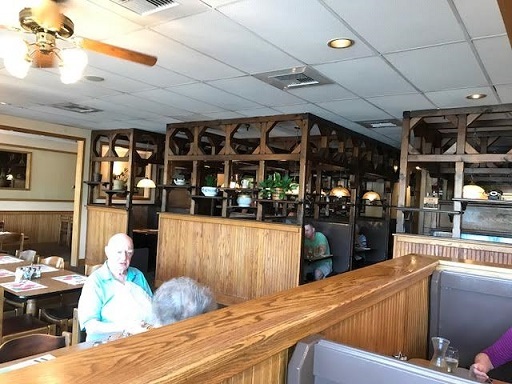 There are tables and booths that get a lot of natural light from the windows, but then there’s a warren of high-backed wooden booths that are fairly intimate, with dimmer lighting. Service was friendly on both visits, and the man at the cash register, probably one of the owners, had a nice touch with everyone, newcomers and longtime customers alike. 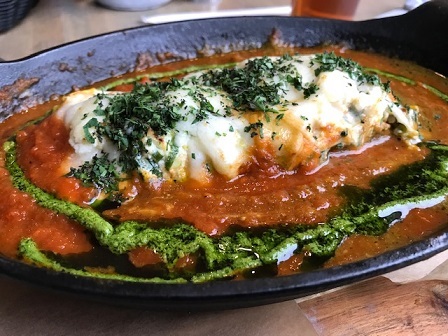 While I can’t say I was wowed by Pizza ‘N Stuff, it’s low-key and family-owned, I liked it well enough, and they’re obviously doing something right. 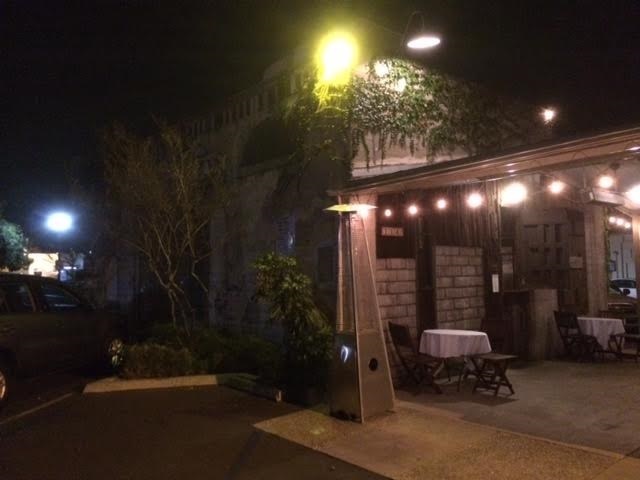 It can be easy to take a restaurant for granted. 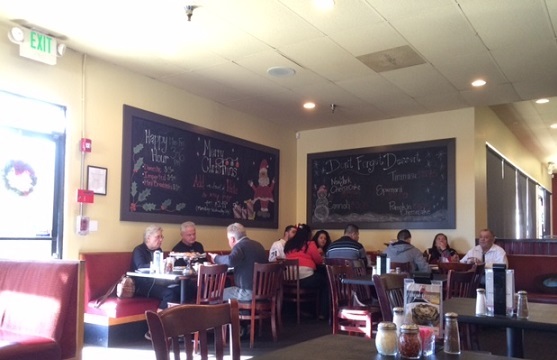 Downtown Upland’s fortunes ebb and flow, but Caffe Allegro has hung in there for nearly two decades. 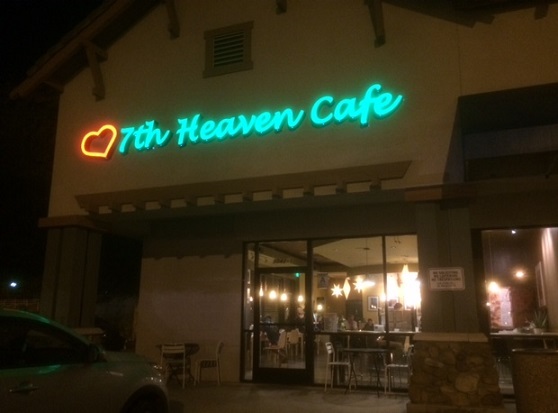 It opened in 1998, five years after the original location debuted in La Verne, and both are still operating today. 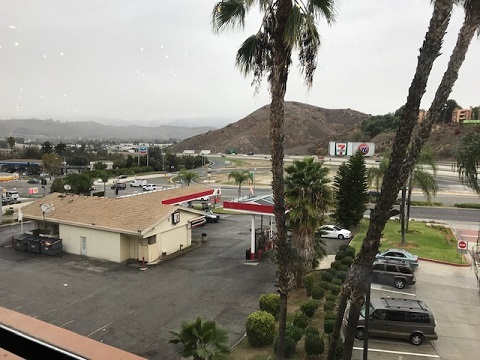 I’ve been to the Upland version perhaps a half-dozen times, both in the early days and then again the past two Decembers, visits that reminded me that it’s an unsung local restaurant. There’s patio seating along Second Avenue; inside, a substantial dining room adjoins a dimly lighted, popular wine bar. Near year-end, an upside-down Christmas tree near the front door is an annual sight. The dining room has high ceilings with rooms-spanning arches, inscriptions in Italian and faux sculptures. Service was low-key and professional. The only problem was the wine three of my friends ordered hadn’t been chilled, and the waiter’s attempt to quick-chill it wasn’t really successful. But they didn’t mind. We also shared a tiramisu ($8). 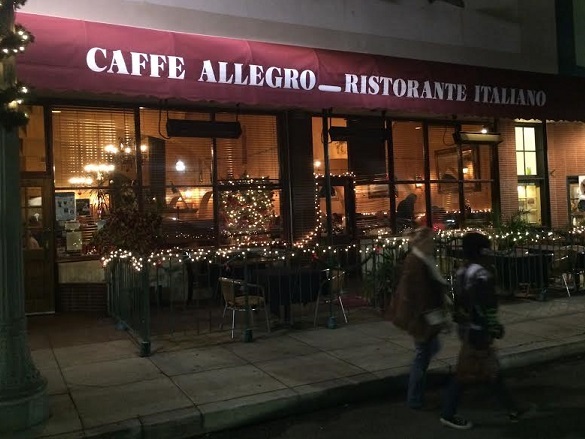 I’m only an occasional Italian diner, but the Italian American at the table had the same conclusion as me: Allegro is among the better Italian restaurants around these parts. Give them a try if you haven’t, or try them again if it’s been a few years. It’s right where it was last time you saw it. 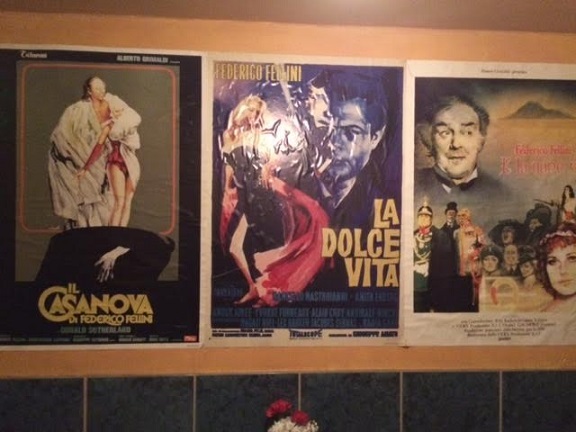 In the hallway leading to the restrooms: Fellini movie posters. Nice touch. 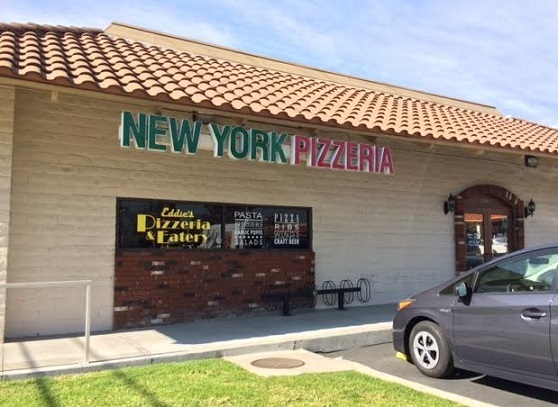 Eddie’s replaced a Straw Hat Pizza a dozen years ago in the Stater Bros. center in Claremont, and I had slices there at lunch a few times before moving on. In more recent years, a friend has raved about the place. Finally we met up for lunch. 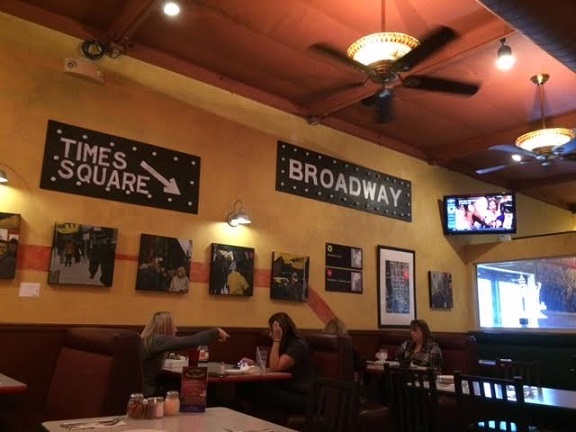 The interior is much as I remember it: a faux New York with ceiling fans, street-like signs and lampposts. Cute. 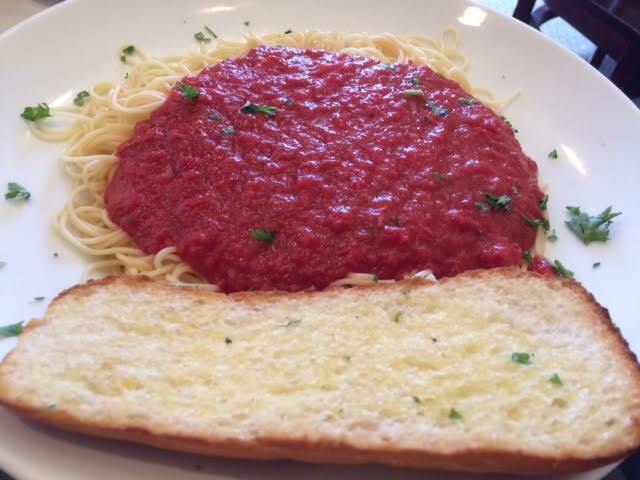 We settled into a red booth and examined the menu, which has pizza, pasta, salads, soups and sandwiches, including burgers. 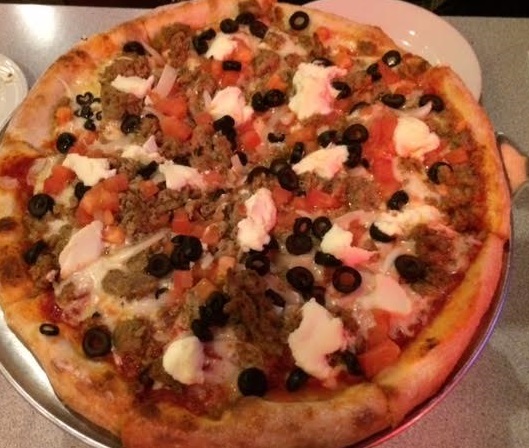 We decided to share a medium Eddie’s Special ($17.45), which has sausage, onions, tomatoes, black olives and ricotta, and also an order of bruschetta ($8.45), which my friend said was a personal favorite that had rotated onto the menu again. The bruschetta was pretty good, a nice appetizer. The pizza was good too. 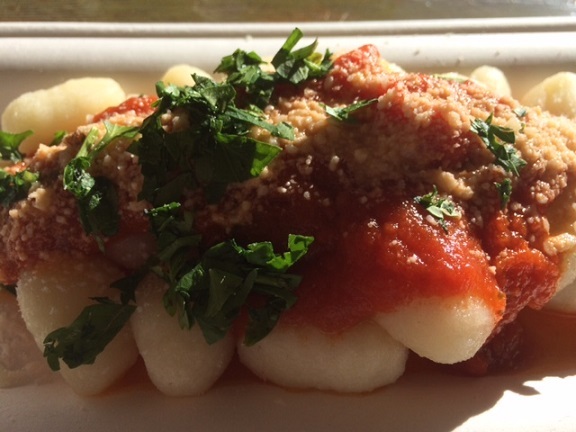 “I love the ricotta. It’s like little bursts of creaminess,” my friend rhapsodized. We each took home two slices, and mine made for a light dinner a few nights later. The sign says Eddie’s New York Pizzeria, the original sign, but the website (eddiesnypizza.com) calls the place Eddie’s Pizzeria and Eatery. 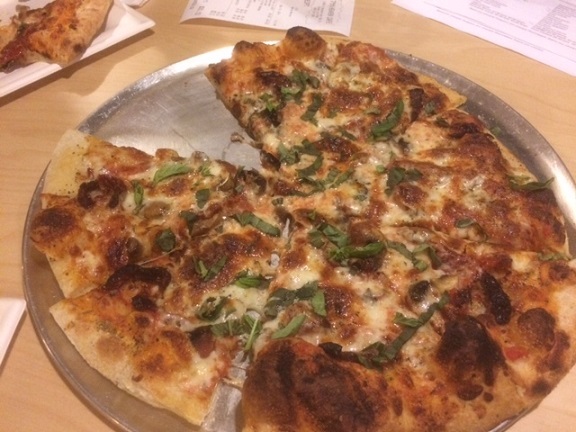 I wouldn’t say the pizza is New York style, but it’s thin crust, and it’s good. 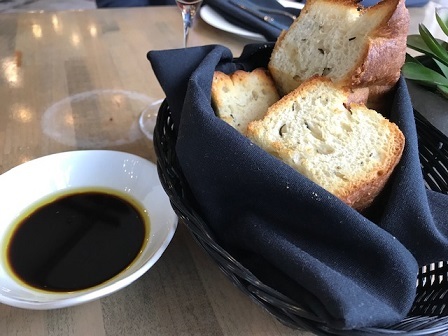 There are some weekly specials that are tempting, like cioppino on Fridays ($19), roasted half-chicken on Mondays ($14) and meatloaf Italiano ($14) on Sundays, each with roasted potatoes or fries, quinoa or the daily vegetable. 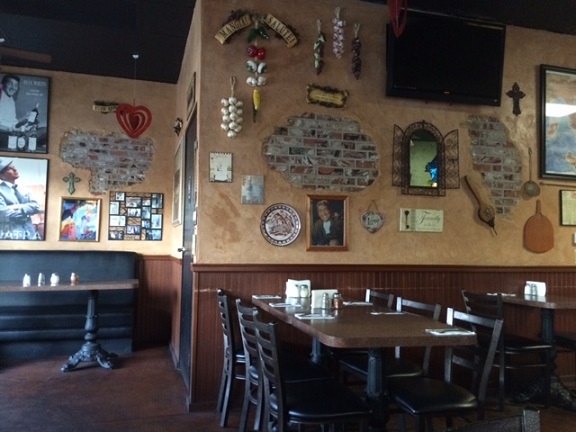 Since its opening, Eddie’s, which I believe from the start was an offshoot of Spaghetti Eddie’s in Glendora, has been folded into the group that owns the well-regarded Tutti Mangia in the Village, which may account for the upgrade. So, while I’m not raving about Eddie’s, I’m glad I returned, and I may be back again. 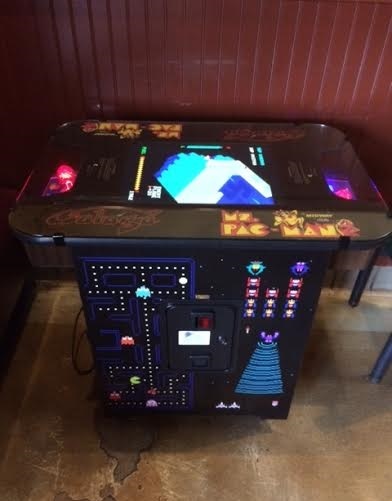 Near the entrance, by the way, there’s a Ms. Pac-Man machine. This is the former La Piccoletta, known as the little place in the alley (Alley 39, to be precise), pretty much in the center of the block bordered by First, Second, Yale and Indian Hill. 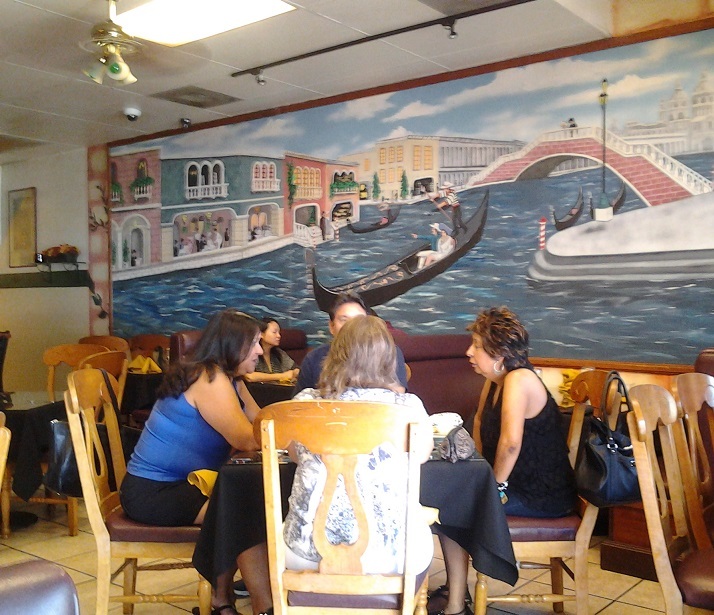 It’s a small building with a trompe l’oeil mural outside and one small room inside. Now it’s been acquired by John Solana and Brad Owen, who have the Back Abbey and Union on Yale; Solana owns Petiscos with another partner. 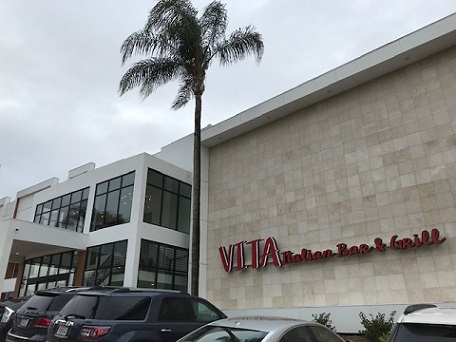 That makes four Village restaurants under Solana’s ownership. 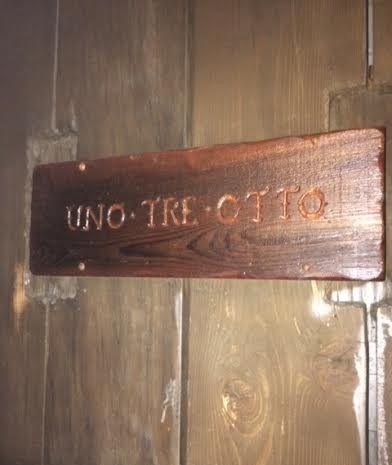 He and Owen quietly took over La Pic in 2014 when it became available and in November, after 38 years as La Piccoletta, changed the name to Uno Tre Otto and focused the menu on regional Italian with local ingredients. 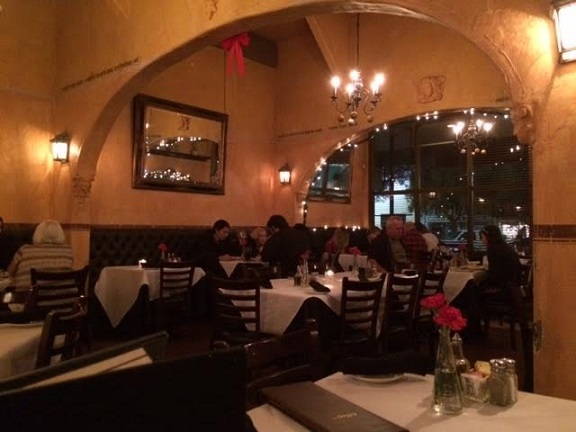 A friend and I had dinner there earlier this month. 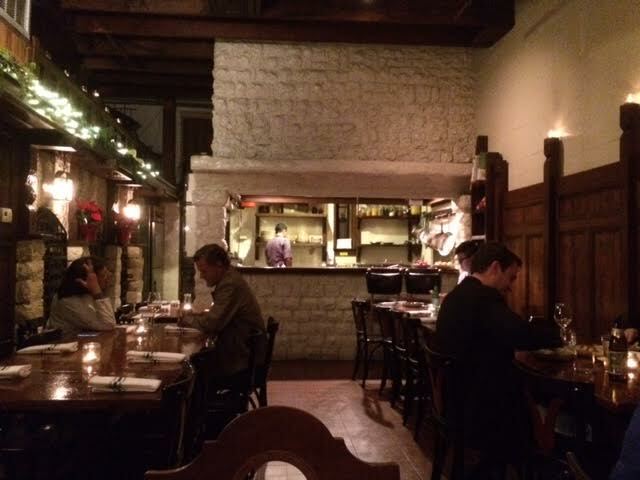 The interior looks much the same: rustic, with no windows and an open kitchen, seating 38 in an intimate space. 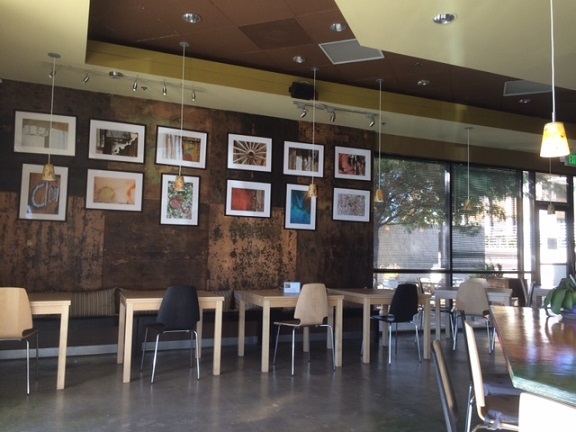 It’s one of the more unique interiors in the valley. 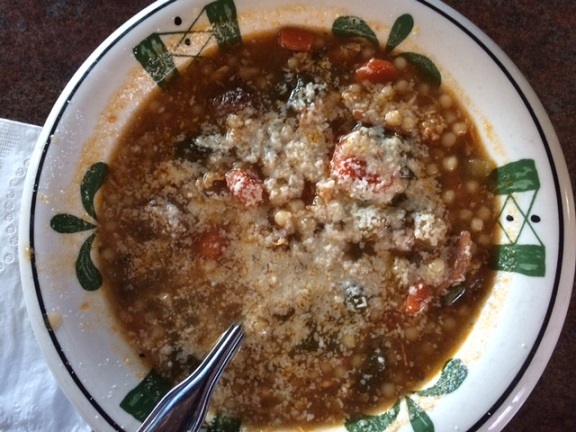 The menu is small and is anticipated to change along with the availability of ingredients, many of them supplied by Amy’s Farm in Ontario, whose proprietor is Owen’s wife. 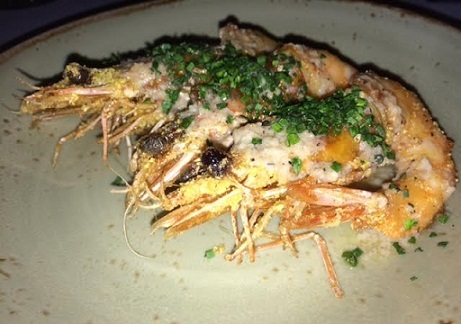 From there we shared wild fried shrimps ($15), four whole shrimp with lemon, garlic, parsley and chives. 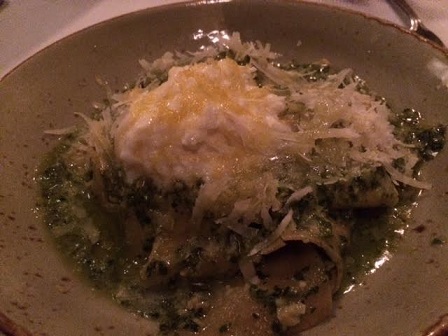 My friend had fazzoletti ($16), a pasta with kale-hazelnut pesto. 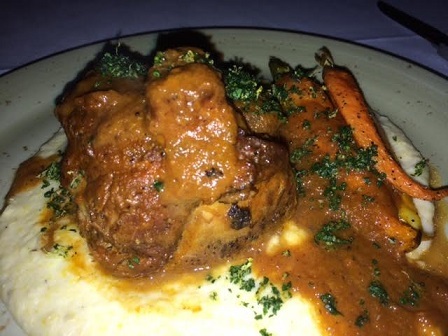 I had pork osso buco ($26), with carrots and polenta. 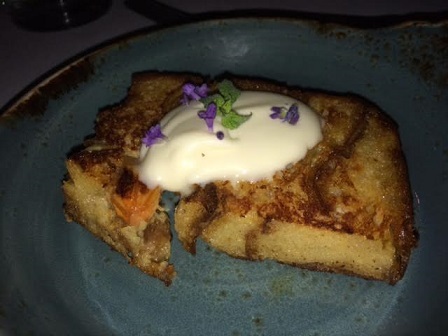 We then shared a dessert, persimmon bread pudding with creme fraiche ($8). On our way out, after paying, I introduced myself to a man who turned out to be Owen, who’d been dining informally with his wife and three of his children. Our waitress, we learned, was his sister-in-law. All in the family. 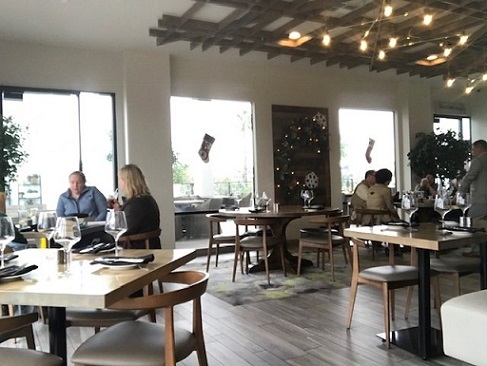 While a meal of $40-plus per person, and that’s with only water to drink, isn’t something I’m likely to repeat soon, those with more ready cash, or celebrating an occasion, might want to give the place a try. 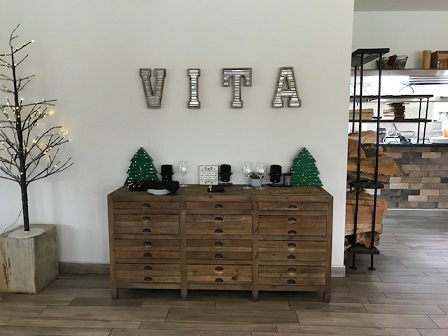 They encourage reservations to (909) 624-1373. 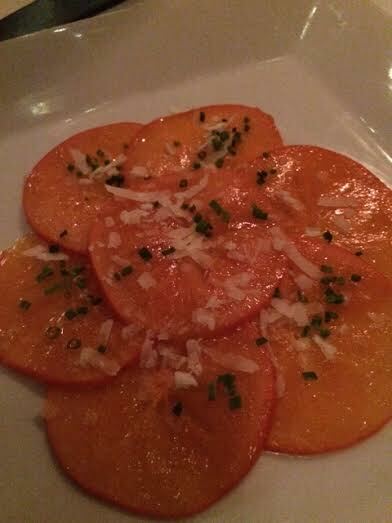 I hope to write a column on the restaurant in the near future, but in the meantime, there’s this blog post. Two friends teamed up to open an Italian market in March, after more than a year of work and a failed crowd-funding campaign. But that didn’t deter them. 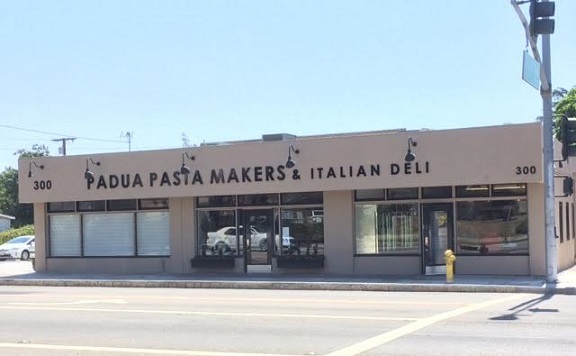 Padua Pasta Makers took over a former dance studio, which operated as a cleaners prior to that, that now is a gleaming, tiled shrine to Italian food. 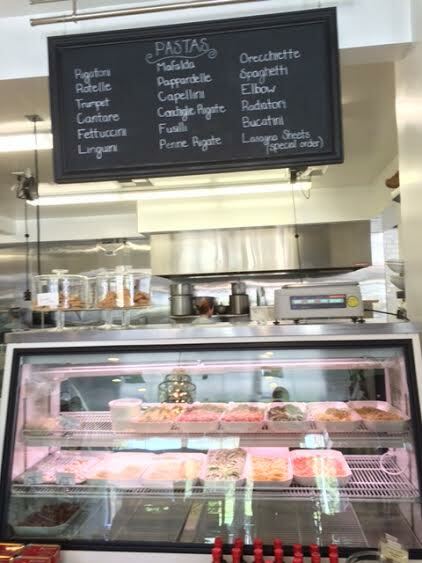 There’s a deli counter with meat and 18 kinds of pasta; refrigerator cases with pre-packaged pasta and sauces made onsite; shelves and tables of canned tomatoes, olives and olive oils; and fresh bread, baked daily. 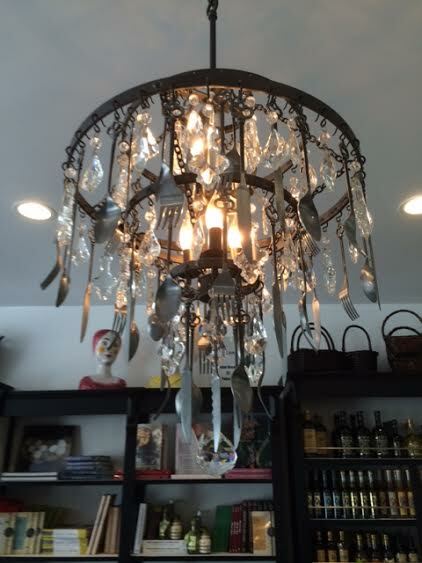 Also, a light fixture made, upon closer inspection, from utensils. 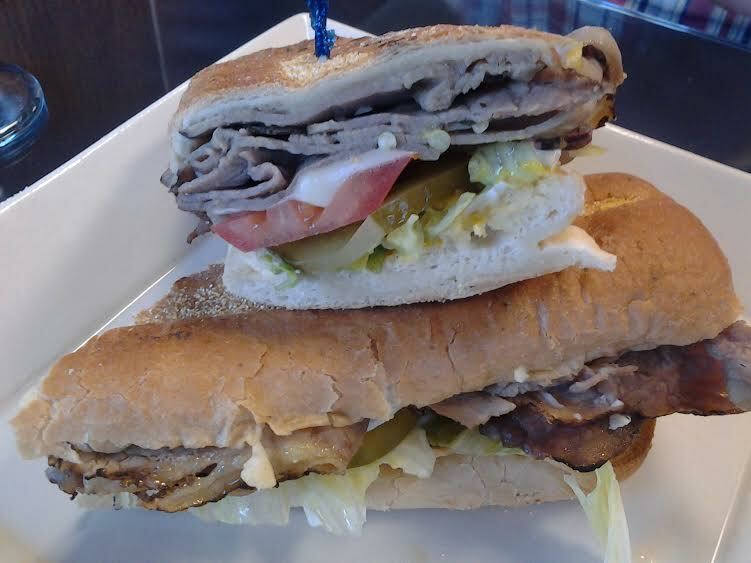 You can get hot or cold sandwiches at lunchtime, 6 inches for $6.50, 10 inches for $8.50. 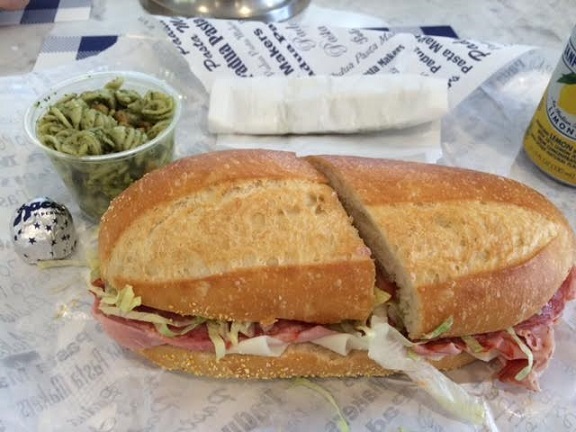 I met a couple of friends there for lunch recently and ordered the Padua Special, the 6-inch version, with mortadella, salami, capocolla and provolone. I got it as a box lunch for $9.50, which gets you a soda, a tiny salad (I chose pesto pasta salad) and a piece of chocolate, not to mention a box. The sandwich was quite filling, and I ended up taking half of it home. Should they make a 3-inch version? 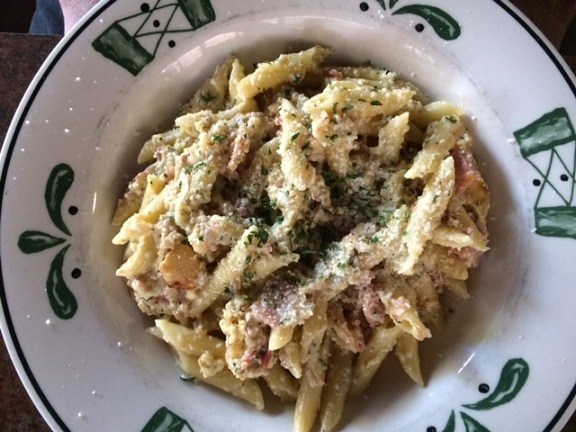 You might be better off skipping the box, as the extras may not feel worth $3. (Although the small piece of chocolate was awfully good.) I’ve meant to go back and buy pasta or sauce to go and will have to do that. 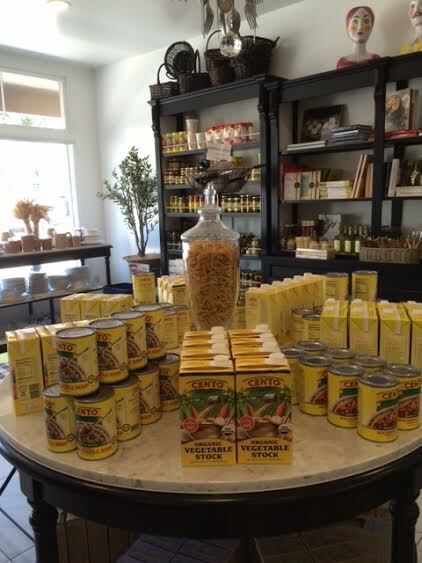 Nothing but the best for the City of Gracious Living.